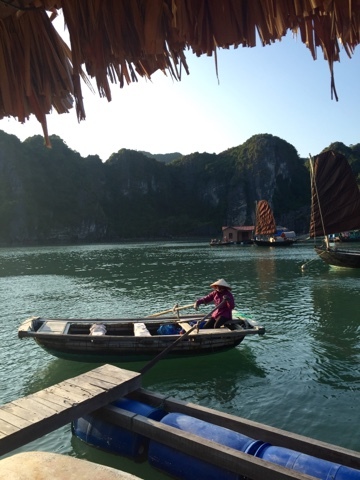 An early start to head to Halong Bay on Wednesday morning, about 3.5 hours from Hanoi. 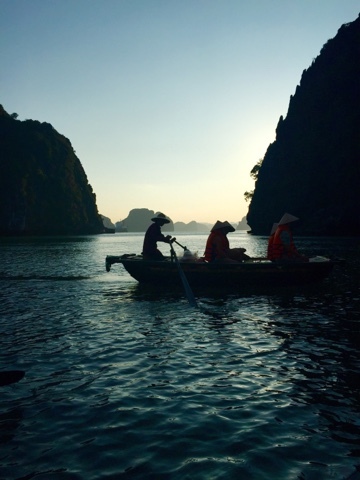 Ha Long, means descending dragon which was the third and final name given to the bay by the French. Upon arrival to our home for the next 3 days we were welcomed to our (accidentally very posh, we didn’t realised how fancy it’d be when we booked) boat with drinks and lovely meal; pumpkin soup, spring rolls, cabbage and prawn salad, halibut with rice and veg and some really tasty chocolate cake to finish. Very fancy and very nice. 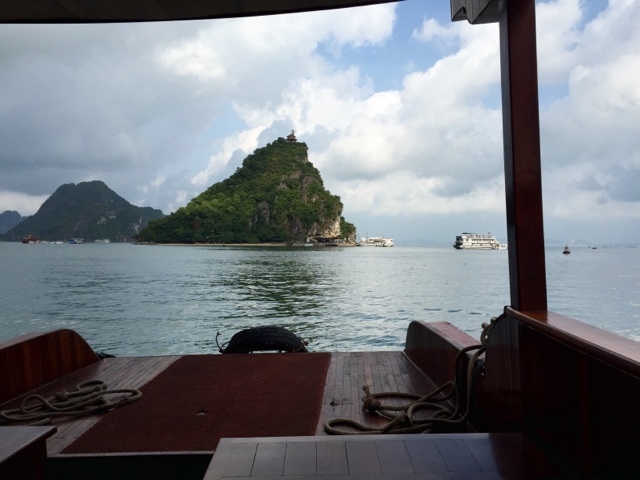 As we headed out into the Bay, the views just got better and better. The huge rocks and islands rising up around us. 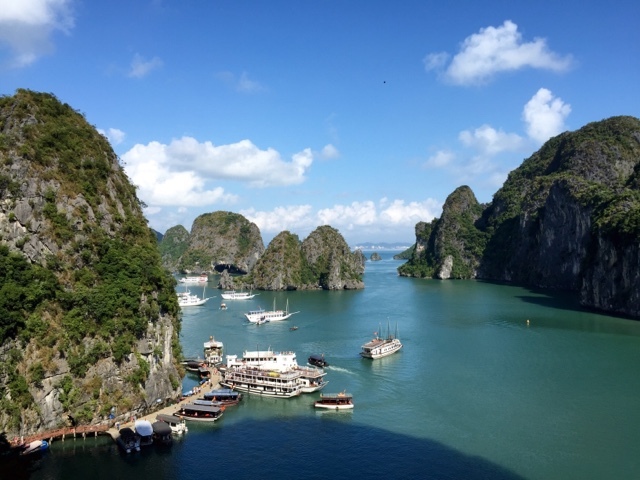 The bay was formed over 500 million years as a result of the earths movements, tectonic downwarping and sea transgression to create thousands of limestone islands which emerged from the sea. 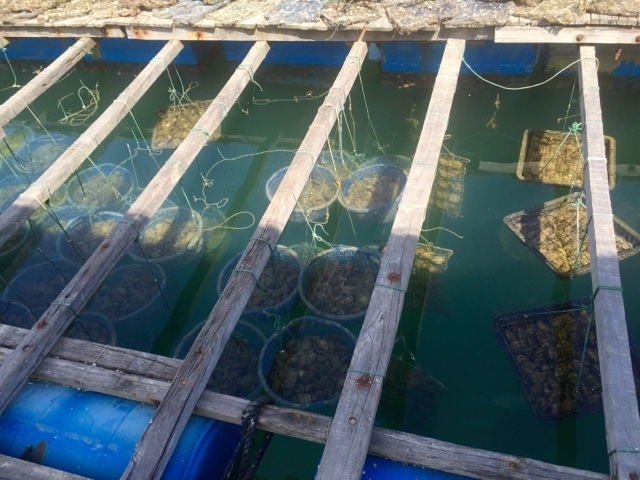 We couldn’t even comprehend that amount of time – it’s crazy! 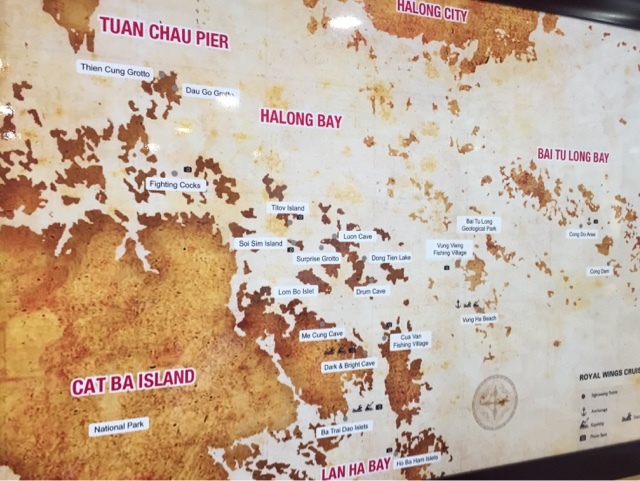 Thousands of species have been found in the area, unique to Halong Bay including 435 plant life. In 2009, the Bay was recognised as one of the new wonders of nature, along with the Amazon river, Komodo in Indonesia, PP underground river in the Philippines, Iguazu Falls, Argentina, JeJu Island in Korea and finally table mountain in South Africa. 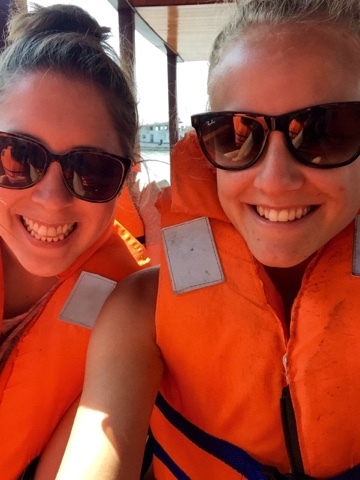 During the afternoon we headed to Vung Vieng, a small floating fishing village. Some of the group headed to kayak at a nearby beach and the rest of us spent an hour being rowed around the small village. The houses were together in small groups, there was a larger area with a small museum type building and lots of different boats and fishing nets all around. We route took us to a gorgeous little cave alcove, and as the sun started to set we got some lovely photos. 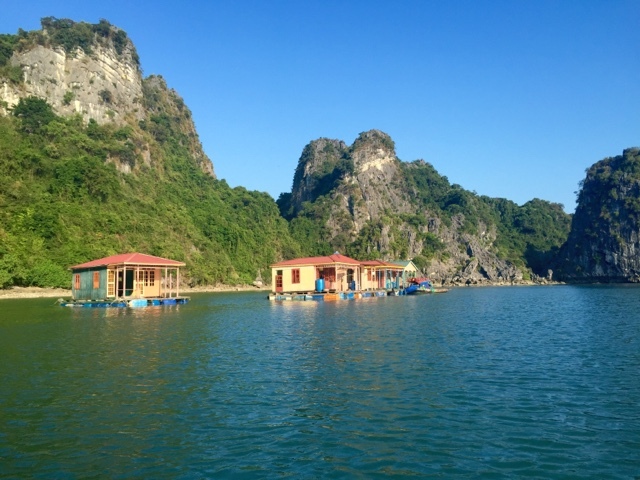 During the evening we moored in an area with so many other boats; apparently 10,000 tourists sleep in Halong Bay every night! 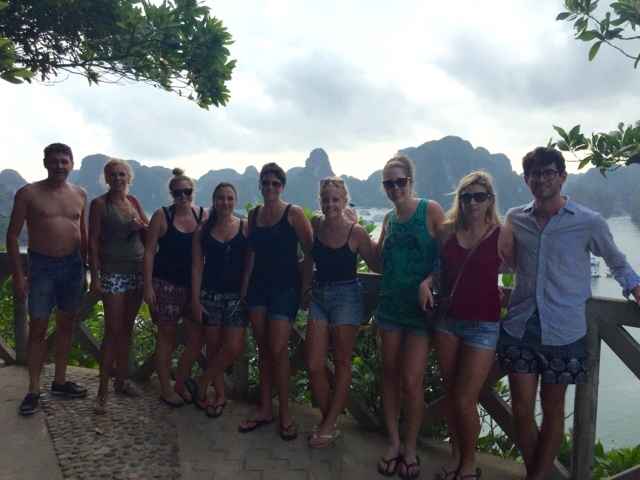 We made spring rolls and ate them for starters, followed by a BBQ which was delicious. Some of our group headed down to the tender for squid fishing but no one managed to catch anything. The following day Rach and I got up for the sunrise but sadly it was hidden by the clouds. 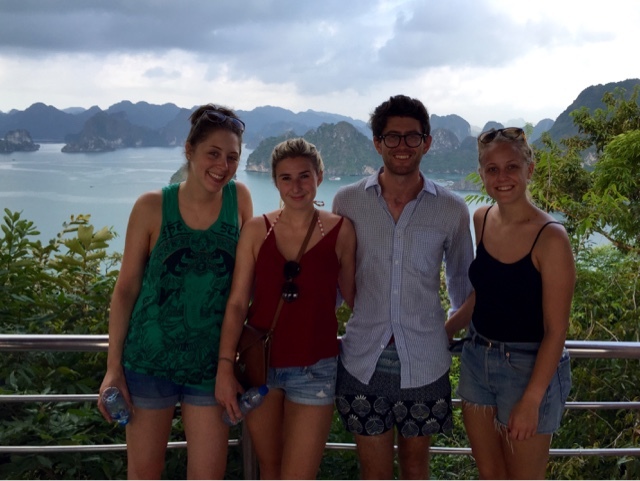 Our first stop for the day was at Hang Sửng Sốt or Surprise grotto. 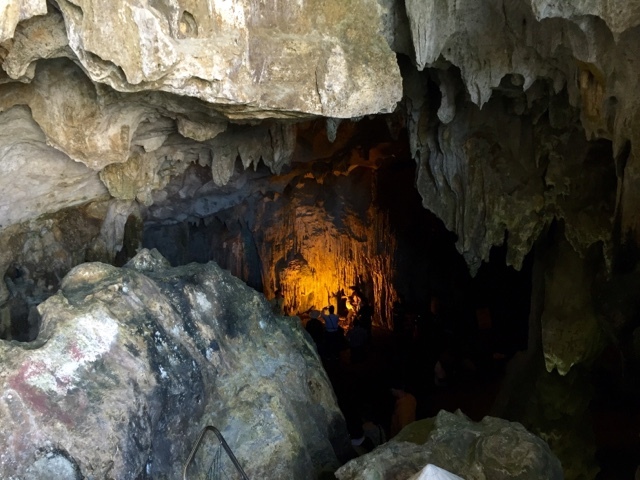 We explored the three caves, and our guide Peter pointed out animals and other things that have formed in the rocks, stalactites and stalagmites. Really impressive – it was found in 1904 by the French after they followed some monkeys. 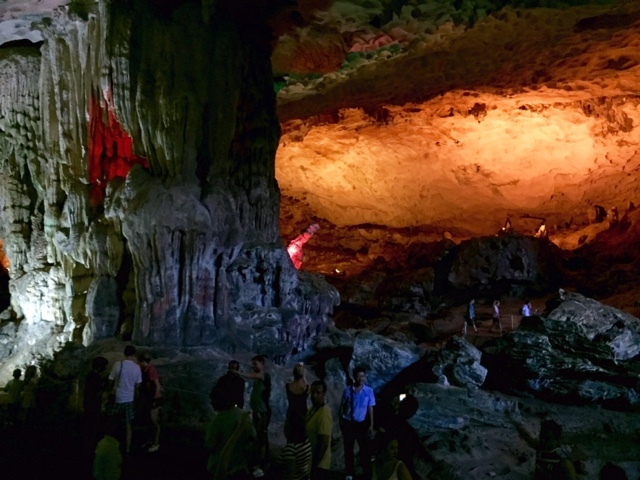 Caves in Halong Bay take between 11,000 – 70,000 years to make as the water erodes away the limestone. 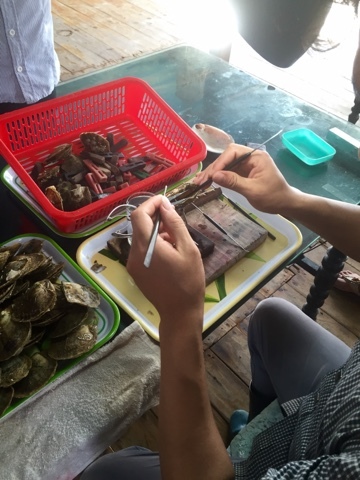 Next stop was the Pearl Farm where wen were shown and explained to, how they create pearls inside the oyster shells. There are three types of pearls; South Sea, Black and Akoya. Each are different sizes and colours and come from different areas in the world. 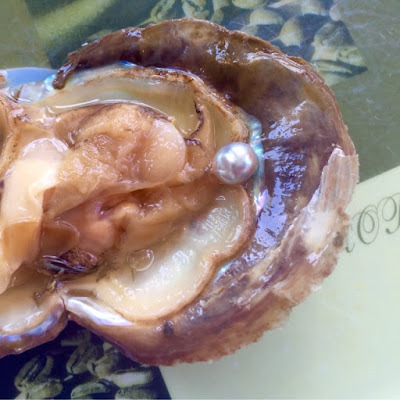 Using a small nucleus made from the shells, at the pearl farm they grow the oysters for around 18months and then take this nucleus and some membrane from the male oysters and insert into the female ovaries where they leave for another 18 months. The calcium builds up over the nucleus and creates that shine and look of a pearl we know. Over 70% die and of that 30% only 10% are ok for use for jewellery. 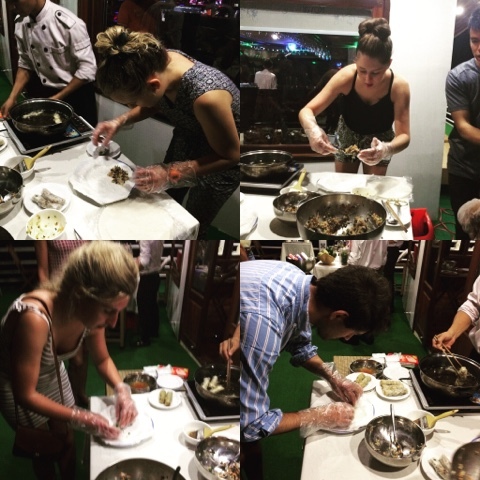 We saw this process happening and even picked out an oyster that had a pearl in it! 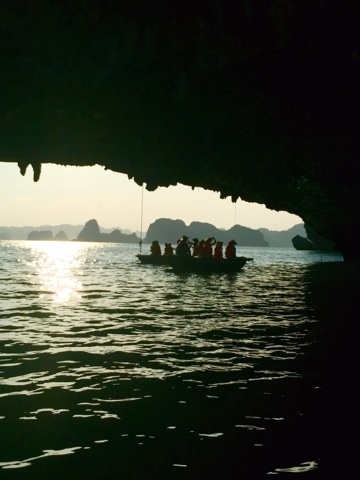 We later kayaked around some caves, known as light and dark caves and followed our guide, who was so much faster than us. Rach and I really struggled to go in a straight line and Rosie’s arms got tired haha. After we’d worked up such an appetite we had so much food for lunch, they just kept bringing it out! 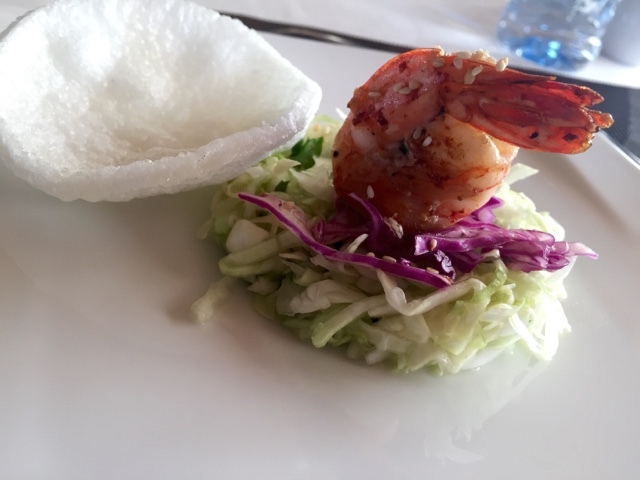 Fish and prawns, cucumber salad and chips and rice and some really nice pork spring rolls wrapped in seaweed, delish! Our afternoon was spent relaxing and snoozing – it seems our busy first week has worn us out completely. 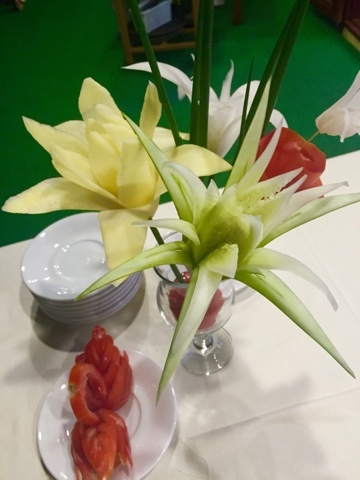 We saw some fantastic fruit carving, the chef made a whole bouquet from potatoes and cucumbers and tomatoes – pretty impressive. After MORE food we chilled with the other guests who were staying onboard for two nights, three Canadian girls and a German couple. We all chatted over dinner and relaxed whilst the Vietnamese staff got into the karaoke in the bar, it’s known that Vietnamese people love singing but we just weren’t feeling it. 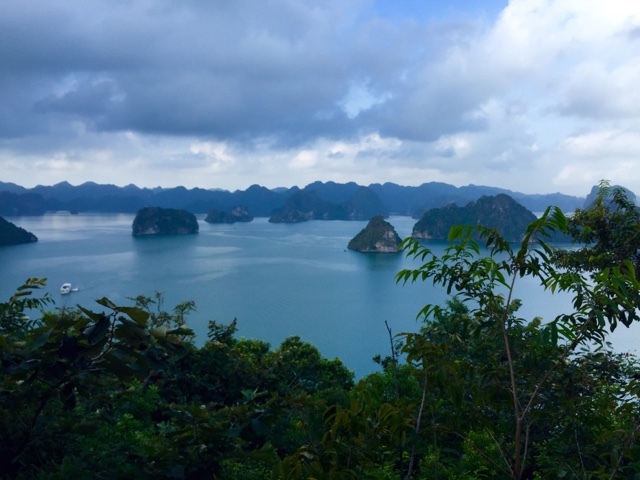 This morning we headed up over 400 steps at Ti Tốp Island for a view over the bay..
Now we’re waiting for our transfer back to Hanoi where we’ve got two nights and a full day tomorrow to explore the capital before we head back to the UK.